We are in the height of summer! And have been enduring some pretty serious heat in Portland over the last couple weeks. The past couple days have brought cloud cover and cooler temperatures, thank goodness! High temperatures are sure to return and we will be ready! There are ways to beat the heat without just blasting the A/C, which is an option I am very grateful I get to indulge in sometimes! Trips to the river always hit the spot, a nice cold finish to a shower offers sweet relief, frozen smoothie popsicles rule! and cooling salads, such as the one below, are some of the sweetest reprieves. Combine all ingredients in a bowl, mix it up, taste it, see what it needs, probably a little salt and pepper, maybe not salt, since feta is quite salty. Your call, your salad. 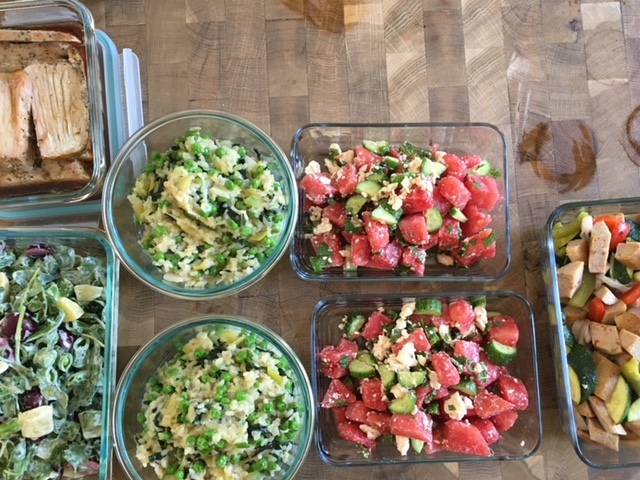 Braised rosemary pork tenderloin, snap pea salad, summer risotto, watermelon feta salad, sausage and veggie tacos, gazpacho and 3 different kinds of smoothies.